One of our fondest memories as a child is learning how to ride a bike. It’s everyone’s first taste of freedom as a kid and remembering those moments as we grow up is priceless. As parents, we want our babies to experience that bike ride too. Let them build their own happy bike memories. But it is important to guide them well and ensure that nothing goes wrong so the baby bike memories will be all pleasant and good as it should be. What age can you take a baby on a bike ride? 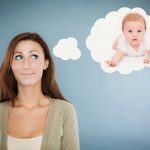 Are there bikes for babies available? What kind of bikes? How do you teach a toddler to pedal? 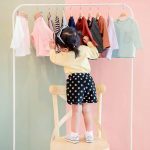 Kids Bike Size Chart: What size should be used for my child? In the US, the American Association of Pediatrics (AAP) suggests that parents start to ride a bike with a baby – usually hauled in trailer or rear-mounted seat – at least 12 months old to 4 years as this time, babies are believed to have stronger necks able to hold a helmet and absorb shocks from bumps on the road. Avoid buying a larger bike for your baby to “grow into.” This will result in a bad fit and discomfort for your child. For babies riding with an adult, the AAP recommends that they ride in a bicycle-hauled child trailer. Knowing when your baby can start riding a bike depends on your personal judgment of your child as parents. Parents believe that as soon as their child begin crawling, that’s pretty much the sign they are ready. In the US however, babies are kept off a bike until they are at least a year old. This is because now they are able to wear a helmet and sustain their heads when riding over bump. They are also able to sit up unsupported. Some Americans started cycling with their kid as early as days- old, three-months or five-months. They however proceeds with caution and the proper bike trailer for their newborns. The AAP recommends that infants younger than 12 months are “too young to sit in a rear bike seat.” They should then not be carried on a bicycle. Children who are old enough (12 months to 4 years) could already be hauled in a rear-mounted child bike seat or in a child-trailer. Parents however should install the proper safety gears to support their child while biking. Read here more about child bikes or our child bike seat guide. Pro Tip: Before biking with your baby, it is important to check the laws in your area when it comes to use of helmet, use of bike trailer and age restrictions. The bottomline is, start biking with your baby always with caution, if unsure, consult a pediatrician to check if your child have the neck development to safely go for a bike ride. Baby bikes are widely available in the United States and it comes in different options to suit the various needs of every child in any age. 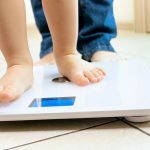 It is important to know the different specifications and features of each bike and weigh your options before deciding to buy a bike fit for your baby. Cargo bike: cargo bikes are ideal for hauling both babies and “big” kids unlike most child bike seats that are only meant for use of newborns. This means that using a cargo bike is pretty much investing on something with a long-term use. In riding with your baby, just attach your baby’s carseat into the cargo. This is most commonly used in family-cycling, plus, cargos are great for hauling all other stuff – from kids books, backpacks, groceries too. Backpacks & slings: this is regarded in many countries, including the US to be “very risky” and potentially dangerous way to carry an infant in your bike for many reasons including – susceptibility to banging helmets together; the child is exposed and more vulnerable in a fall due to the position; and there is a higher chance of the adult crushing into the baby in a case of a tumble. On the other hand, slings also present similar issues with backpacks except that the child is positioned lower down near the adult’s chest and their head is better supported. The baby however is unlikely to be wearing helmet in this set-up. Both the backpack and the sling provides less protection than a child seat or trailer. Some states in the US demand riders in bicycles to be at least one year old. And, some areas also have helmet laws for children at all times, even children riding in a trailer. Front-mounted baby bike seat: a front-mounted baby bike seat is usually installed in the front side of the parent’s bicycle, right behind the handle tube. Depending on the bike model and brand design, front-mounted bike seats for kids are usually attached to either the seat post or head seat of a bike.The advantage is that front-mounted child seat usually comes with a harness to hold your baby in place and this model is recommended for older kids and toddlers (ages 1-3 years). This is safer when biking as it sets your focus in front while biking instead at looking back to check on your child. Your baby will also have the best “front seat” view and this child bike seat is usually lighter, cheaper, and more capable of fitting thru tight spaces compared to others.The downside for this bike seat is mainly on crash concerns. In the event of a fall, there’s a big chance that your child is going to get hurt as the front-mounted seat exposes the child more than a trailer does. Riding with a front-mounted seat also needs some time since the bike seat is placed right where your knees are generally hitting causing a bowleggedness. Using this seat over long distance is also not suitable. Compatibility issue us also a concern Front-mounted child seat also have a limited usage since it is only good for kids around 30 to 35 pounds. Rear-mounted baby bike seat: a rear mounted baby bike seat is secured to the rear rack or seat post of the adult bike. It is the most commonly used means of riding with kids and babies because it is affordable, it fits on nicely in nearly any kind of bicycle and can be used by a wide range of ages.The advantage is that a rear-mounted baby bike can be used for a long time mainly because it fits many size range. This is also suitable for sleeping babies and is viewed as generally safer as it protects your child from falls.The downside is that the adult may need to keep looking back to check on the child in a rear-mounted baby bike seat which could be risky especially riding in a vehicle-dense area. Putting too much weight in your rear could also post problems in biking uphill and may result to tipping over.It will be bumpy for your child back there, so you might need to consider that too. Bike trailer: an affordable option and the good old practice common among recreational cyclists when riding with babies. This is a popular choice if you’re riding with your toddlers up to 6 years old but usually not with your infants.Some advantages is that bike trailers are usually stable and easy to steer. Under certain circumstances that you fall, your child passenger won’t and you get to cycle and have the control, while the kids could see the sights.The downside however is lesser visibility to other cyclists; potential jostling while biking on rough surface and kids are a bit more exposed to the exhaust of cars which may post health risks. For babies riding with an adult, experts recommend riding in child trailer. Know what type of mounting you want to use. Consider its compatibility to the bike you are using. Consider the child weight limits for the bike seat options. Seat weight and reclining options. Suspension should always be there. Shoulder straps is another must to secure your child properly. Teaching your child how to ride a bike could be tricky but once your child learns it, biking becomes an automatic skill for a lifetime. 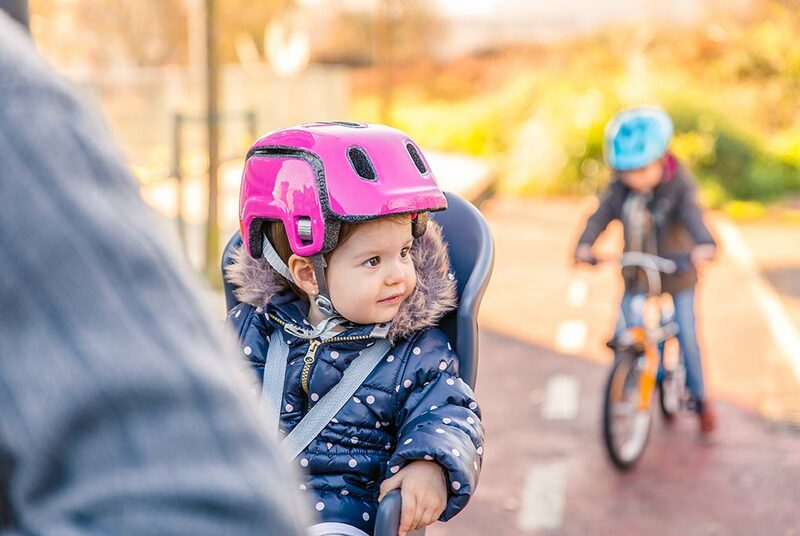 Most parents start training their child even before they learn how to pedal on their own – connect a child carrier to your bike or strap in your child and go for rides regularly could be a good start. The first step is to find the appropriate bike for your child were their feet touches the ground when seated with straight legs. Opt for lighter bikes that halts by pedaling backward to prevent unnecessary distractions from handbrakes. A good starting tool to help you out is a balance bike. This will teach your child how to balance and control first since this have no pedals. When teaching your child how to pedal, it is best to do the practice in an open space, free from moving vehicles or distractions that may post a threat to your child’s safety and make them feel nervous and scared. An empty parking lot, an open-field or a school playground is recommended, while narrow streets and traffic-heavy areas are not advised. Start teaching your child by asking them to pedal on their own while you hold the bike. Train them how to stop by pushing the pedals backwards and laying their feet on the ground. While your child practice pedaling, hold the bike seat to help your child balance. Remind your child to look infront and not up or down on the ground. You may choose to jog a little bit alongside your child until he/she is comfortable enough and balanced on the bike, then let go. Do this again and again so your child can get a hang of it. Once your child is comfortable on the bike, teach him how to start biking on his own. Start by teaching your child to put one pedal up forward and stomping down a little bit to get the bike moving on their own without your support. Learning how to ride a bike can take a day, a week, weeks or longer. The most important thing is to make learning fun and exciting so your kid will look forward to practices until they can do it on their own. TIP: Parents should choose areas without loose soil, such as gravel or sand to minimize slipping and untoward falls. It is best to train the child in a softer surface first to ensure a smooth biking practice. Balance Bike: this is a bike with no pedals or chain, just wheels and a frame to start up teaching your child how to start steering and balancing. This is usually best for teaching 2-5 year olds how to bike to eventually transition them to the real pedaling. Trailer Bike: a single-wheel bike attached to either your seat post or on a rear rack of your bike that allows your child to pedal on his own and feel independent, but still relying on you mainly for balance, control and steering. This type of bike is good for 4- to 7-year-olds. Training Wheel Bike: training wheels are there for a reason – giving your child enough support to prevent falls while they get acquainted to riding the bike. Once they’ve practiced enough and have the confidence to start riding the bike on their own, the training wheels can then be removed. Kids Bike: congratulations, you made it! This is the part were you tell yourself as a parent, “good job”. Your child is ready to own their very first two-wheeler bike but make sure to avoid the common pitfall of buying a bike that your child will “grow into” which will result to a bad fit and a riding experience that may not be too comfortable for your child. If you’re still unsure whether to let your baby ride his/her own bike, you may opt to use a Tandem Bike for a little bit to allow your child to pedal side by side with you, while the parent still have the control over steering and braking which could familiarize your child how to operate steering and braking at the right time. When buying the right bike for your baby, be aware that child bikes are usually measured by their wheel size, not frame size. The right size is the bike where your child can comfortably get on the bike and stand with his or her feet on the ground although tiptoes is also okay. Find more information about kids bike sizes here. Which safety gears should my child have when he/she starts biking? Helmets: helmet is the main safety gear required for anybody riding a bike. It is also the most important wear for both adults and kids to protect the head in the event of a fall. As prescribed, helmets should fit comfortably in your head with the safety straps attached and shouldn’t be too wobbly or loose. 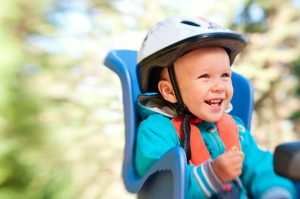 You may pick a colorful helmet or a helmet with an unconventional design to add fun to your child’s ride as long as it fits your child’s head well. Bright Clothing: wearing bright-colored biking outfit is usually recommended for bikers for visibility purposes for pedestrians, drivers and other bike riders too. Shoes: closed-shoes is usually recommended to protect your toes from pedaling. If possible, shoe laces should also be tied securely to avoid distractions and falls. Pads: wrist pads, knee-pads and elbow pads are recommended for bikers specially the little ones who are just beginning to ride. This will help prevent bruises and wound in the event of fall or crash. Reflectors: reflectors are also very important for visibility. Although your child will not ride the bike at night, it is important to put reflectors in the bike to ensure that your child could be easily seen even afar by other riders, cyclists and drivers. Pro Tip: Bikers are also expected to heed road signs at all times. They need to get off the bike when crossing the street, they need to follow the stop signs and avoid the use of electronics when biking as it might post risks to accidents and ruin the whole biking experience.